Jean-Claude "Baby Doc" Duvalier, the son of the infamously corrupt and authoritarian Haitian president François "Papa Doc" Duvalier, was president of Haiti from 1971 to 1986. Born on July 3, 1951 in the Haitian capital Port-au-Prince, he grew up largely in isolation, spending his time inside the presidential palace. He rarely left the capital and never traveled outside the country. When Jean-Claude was twenty years old, his father, the self-appointed president-for-life, died. On April 22, 1971, before his father’s funeral had even taken place, Jean-Claude Duvalier was installed as president. Obese, clumsy, and clearly affected by the sudden attention from the international press, "Baby Doc," as dubbed by the press, proved to be a weak and impressionable figurehead. For the first years of his presidency, his mother, Simon, and his sister, Marie-Denise, ruled by proxy. Though Jean-Claude released political prisoners from his father’s regime, increased cooperation with the United States, and reduced media censorship, he quickly confirmed that the Tonton Macoutes, the terrorizing and corrupt paramilitary founded by François Duvalier’s administration, would remain the country’s force and that no opposition to his government would be tolerated. Under the rule of "Baby Doc" malnutrition and famine continued, as they had under his father’s regime. Many Haitians attempted to leave the country, overcrowding boats that transported them to the United States. Others fled to the Dominican Republic, where they were exploited as a source of cheap labor on sugar plantations. Foreign officials and observers, however, seemed more tolerant of "Baby Doc" particularly in areas such as human-rights monitoring. Following the lead of the United States which restored its aid program soon after "Baby Doc" came to power, they poured millions of dollars into the nation, much of which was stolen by the Duvalier family and close supporters. It is estimated that in 1980 alone, the Duvalier family siphoned $16 million of the International Monetary Fund’s $22 million in aid with another $4 million given to the Tonton Macoutes. The aid that was not deposited directly into the Duvalier family’s bank account served to modernize Haiti’s infrastructure by updating roads and providing rural areas with drinking water and electricity. However, many of the modernizations benefited the urban middle and upper classes, who had the means to buy up the previously inaccessible rural land. Eventually foreign opposition and a popular uprising opposition forced Baby Doc Duvalier to flee Haiti for exile in France in 1986. 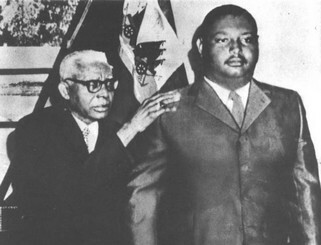 While in exile Duvalier spent almost all of the money his immediate family had stolen from the Haitian national treasury. By 2011 he was forced to relinquish formerly lavish lifestyle on the French Riviera and moved to a two bedroom apartment. Later that year he was allowed to return to Haiti where he spent his last years in a suburb in the hills surrounding Port-au-Prince. Jean-Claude Duvalier died from a heart attack at a friend’s residence in that nation’s capital on October 4, 2014. He was 63.